Readings, show and tell, and a puppet show! 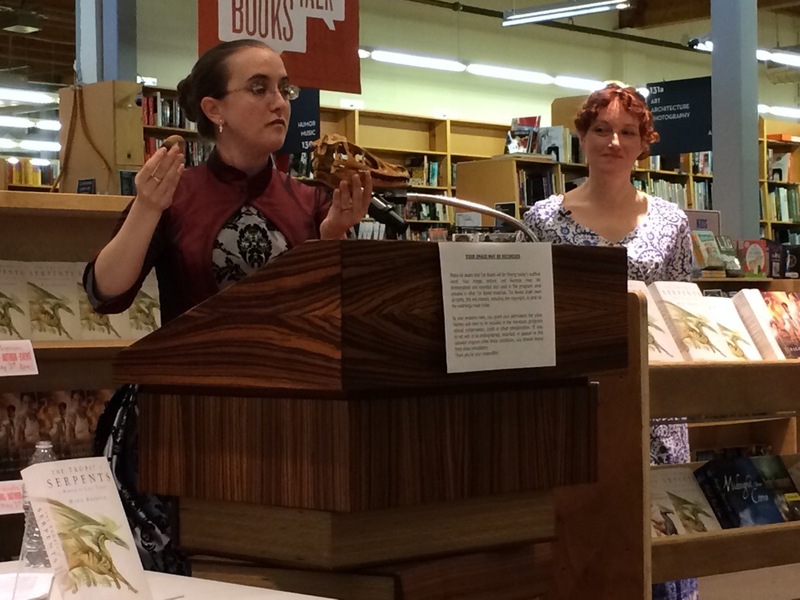 Authors Marie Brennan and Mary Robinette Kowal are on tour together and recently stopped by Powell’s Books for an author event. 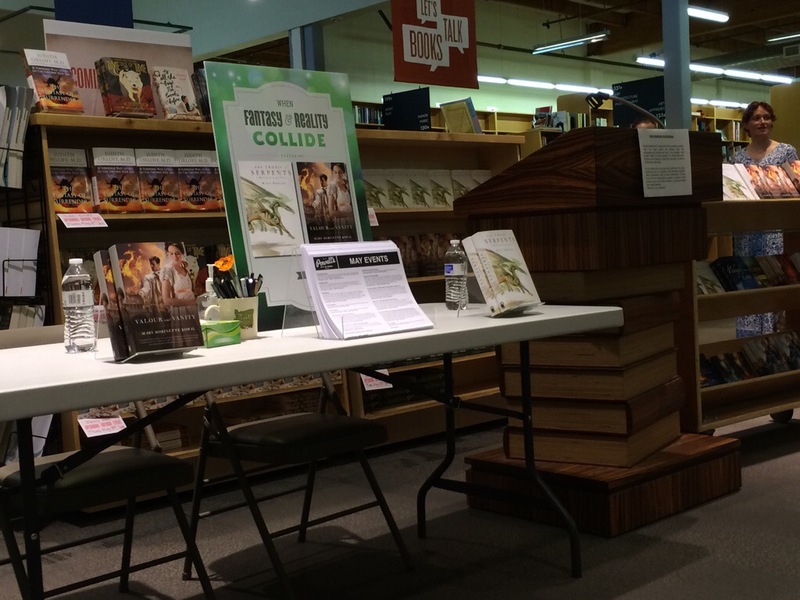 All set up and ready for the two authors, Mary Robinette Kowal and Marie Brennan! Both have brand new books out: Tropic of Serpents by Marie Brennan is the second Lady Trent book, a series that started with A Natural History of Dragons. Mary Robinette Kowal continues her Glamorist Histories, a series that started with Shades of Milk and Honey, with Valour and Vanity, the fourth book. Each author also has a new book in the works, scheduled for future publication, and with perhaps a bit of conniving glee, both read from these selections. Voyage of the Basilisk isn’t due out for another year, but despite this, we got to hear from Marie Brennan about Lady Trent’s adventures studying sea serpents while submerged in a diving bell. Show and Tell, Dragon Naturalist style. Marie Brennan even had items of interest to show us, showing us how Lady Trent may show off items of curiosity on lecture tours. Dragon skull anyone? Her fifth book in the glamourist series isn’t due out until 2015. 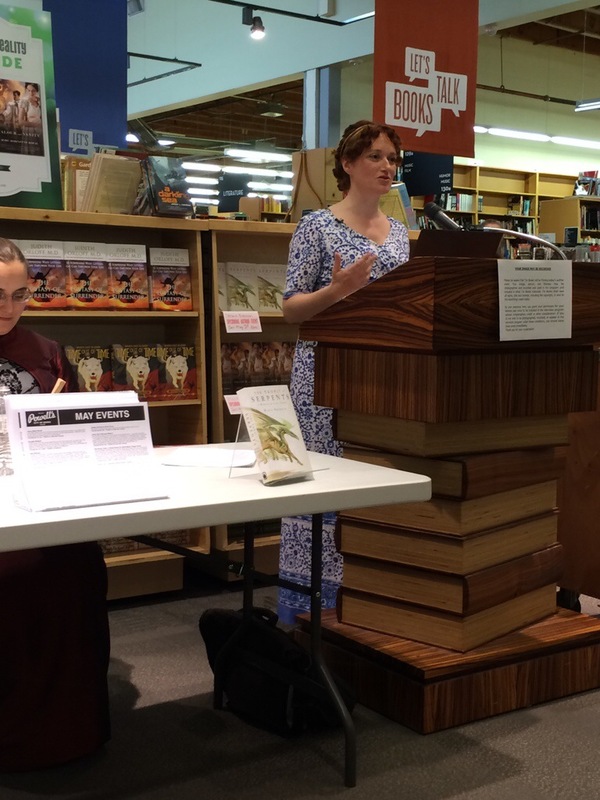 Showing the audience no mercy, Mary Robinette Kowal also read from an upcoming book, the fifth book in the Glamorist Series. She treated the audience to a hilarious tale from Vincent’s youth. Both ladies sneakily ended their readings on a cliff-hanger. We have to wait until 2015 to read these books? The horror! In a unique twist on an author event, Kowal also performed a puppet show, “The Broken Bridge,” that was extremely popular during the time period in her books (Regency Era). In fact, it’s her character’s favorite puppet show and shows up twice during the series. 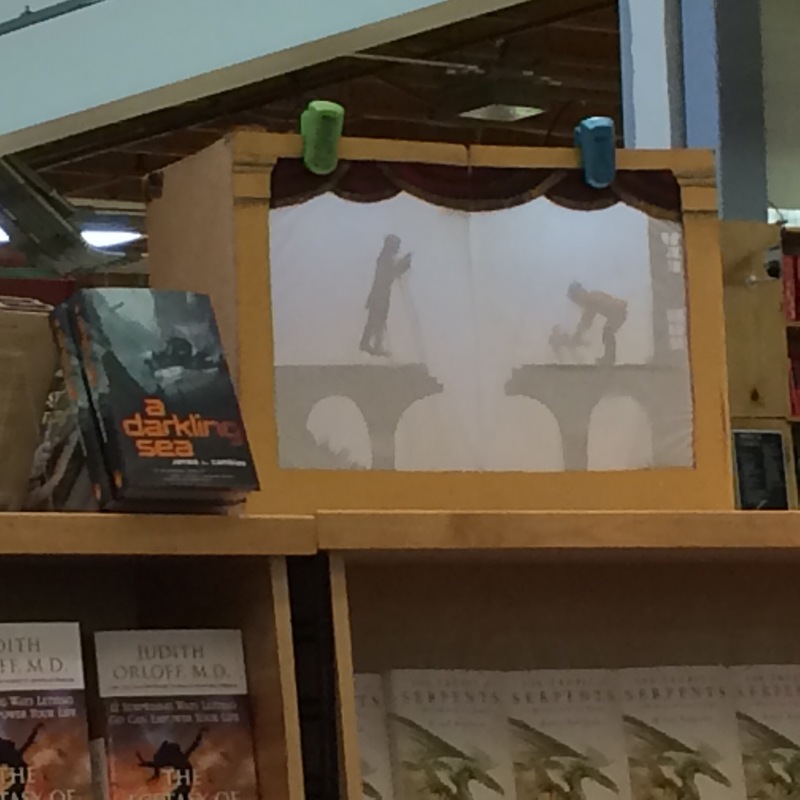 Mary Robinette Kowal, in addition to being a renowned author, is also a professional puppeteer. Both authors showed up to the event full of energy and happy to share with fans. I thoroughly enjoyed the event. The fantasy books by the different authors also complement each other– if you like one, you’ll probably like the other. If you have a chance, go to their author event. Take a look at their tour schedule and wish Mary luck in her travels (she has her fair share of bad travel stories, and even her own hashtag: #marygoround). 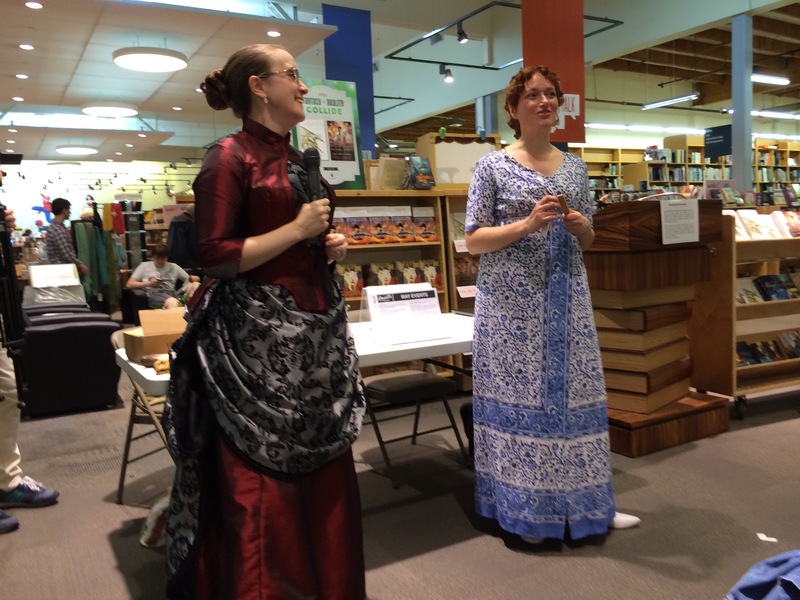 How many authors show up to their event in period costume matching their books? Kudos to Marie and Mary!